The reality of Six Sigma, Lean and the various combinations of these programs is that, for as good as they can be, once the low hanging fruit has been process, the return on investment not only slows down but it may become negative. You cannot cut your way to long term success or violate the law of diminishing returns. Innovation and revenues are constrained by Six Sigma and Lean in the long term. The good news is that you don't have to scrap your program. The recommended solution is to adapt the existing Six Sigma, Lean continuous improvement program to include the deliberate support of innovation and profitable revenues. See the survey on Continuous Improvement programs. We add concepts, tools and processes that support deliberate innovation, build sustainable cost reductions and develop increased profitable revenues. This is done quickly and cost effectively. It only takes a few weeks to a few months to make measurable progress with delivered results. We use a staged approach to assessment and modification to make sure that the process is effective and efficient of maximum benefit. Our approach is careful to sustain the cultural and financial benefits of the work that has already been done with your existing program. Modifications and additions will be seen as beneficial and logical in today's business context. This approach assures that the process pays for itself and you are fully satisfied with the scope and direction that your initiative takes. Years of cutting and Lean improvement in a tough economy have created some problems. The DuPont Corporation ran into a wall with Six Sigma about five years ago and made the transition to Lean Six Sigma (the DuPont Production System modeled after the Toyota Production System (Lean)) to add the Lean tools to the tool kit. The challenge then shifted to one of realizing sustainable projects that actually improve bottom line profitability. Tens of millions of dollars of savings and improvements that had been projected proved to be either unrealistic or unsustainable. The solution that we have been implementing for over a decade is to include revenue growth as a core component of any continuous improvement program (e.g. Profit Improvement Process). Revenue growth is theoretically unconstrained - not quite infinite but certainly not as finite as what has historically been cut, cut; cut. Profit is a function of Revenue, Expense and Loss. Lean and Six Sigma do a good job with some expenses and most losses. It is now time to add Revenue to your equation. As good as programs such as TQM, Six Sigma, Lean and the combinations are, it is important to recognize that these programs must evolve to achieve their full potential. 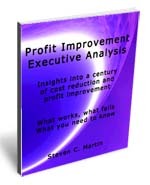 FREE OFFER: Send me an request through our contact form and I will send you a FREE copy of the detailed white paper "Profit Improvement Executive Analysis" which will give you what you need to know about Six Sigma / Lean, cost reduction and profit improvement programs and assist in your decision making.